Click on the photos for further information on what we can offer for each dance style. Due to the unique talent and experience within the Star Dancers UK team, we are able to create fusion performances for just about any combination of dance styles. So if your event involves a mixture of cultures, or you would just like to see something different, get in touch with us to see what our dance experts can do for you. Our dancers have expert understanding of the expressiveness, glamour, femininity and sensuality within Bollywood. If you are looking for an exciting, action packed and energetic dance performance to spice up your Bollywood themed event, look no further and hire Bollywood dancers from us. Looking for that carnival atmosphere? We perform authentic Brazilian Samba suited to any Rio themed party or event. Hire Brazilian Carnival Samba dancers from us and let our showgirls and samba boys bring that sizzle to the stage with a sparkling Brazilian Samba performance. Planning an Arabian Nights themed event? 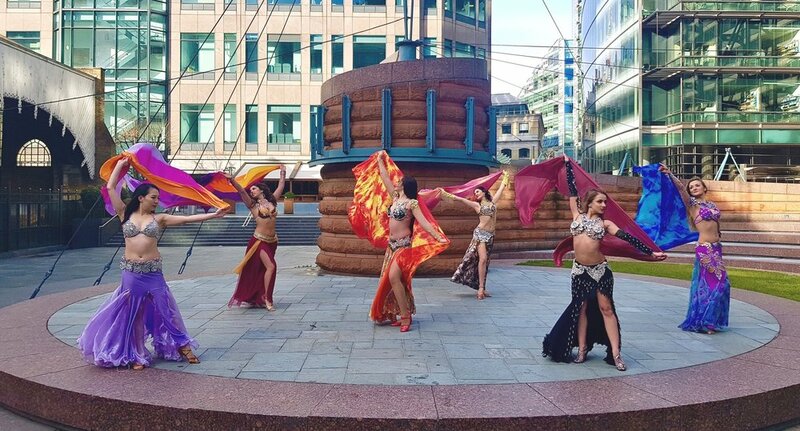 We perform authentic Egyptian and Turkish bellydance, and our performances include an interactive element to help liven up your event. If you are looking for that extra-special touch, hire our beautiful and family friendly Bellydancers from us. We are also the only dance group in the UK with a male bellydancer. If you’re looking for some glamour and glitz for your Vegas-themed event, why not hire our stunning showgirls? Let our beautiful feathers and sparkles wow your guests and hire our Vegas-style showgirls to help get your event to a sizzling start. Looking for the spirit of “All that Jazz”? Looking for a touch of theatre? Let our cabaret dancers bring a fun Burlesque show to your next event! Hire our Moulin Rouge style entertainment, and our dancers are sure to help you cabaret the night away at your next event. Our dancers perform traditional Hawaiian Hula and Tahitian Dance and are the only dance group in the UK to specialise in the Hawaiian Uli Uli rattle. We perform both traditional and modern Hula styles and provide fun, interactive workshops. Look no further for an authentic Polynesian vibe at your event and hire our Hawaiian dancers. Take a step back to the 1920s/1930s and let our Charleston dancers and flapper girls bring your Great Gatsby event theme to life. If you’re looking for authentic and fun flapper-style entertainment, hire our Great Gatsby dancers for your next event. Contact us with your specific requirements to see what we can do for you.